Forget Schindler and Private Ryan, this is Spielberg's masterpiece, a near perfect film directed with astonishing skill and unafraid to get sentimental ... without crossing the line into syrup. Now Spielberg has returned to the original negative, touching up the special effects with digital technology, remastering the original score and adding back some deleted scenes that help round out the characters a bit better. The result is terrific, not because of the changes (which are virtually invisible), but because the film is back on the big screen after all these years. It's the story of two lost souls: Elliot (Thomas) is adrift following his parent's separation, while E.T. is an alien botanist whose spacecraft flies home without him. 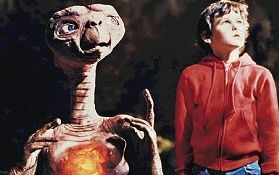 The two get together, discover a psychic bond and have all sorts of adventures as Elliot tries to help E.T. phone home ... and then get there. Along for the ride are Elliot's brother and sister (McNaughton and a feisty, hilarious 6-year-old Barrymore), their independent and worried mom (Wallace), and a scientist (Coyote) who's always dreamed about meeting an extra-terrestrial. Spielberg's direction is so surehanded that it takes the breath away--he knows exactly how to tell this story and never puts a foot wrong, showing us everything from Elliot and E.T. 's perspective and keeping it all much more earthy and realistic than this kind of film would ever be if made today! OK, so there is one shot too many of those bicycles flying in front of the moon or sun. And the ending is relentlessly emotional (just try not to cry!). The plot is old as the hills, eerily familiar and yet utterly fresh as well, drawing on old movies and legends to weave together a deeply moving tale of childhood. Easily one of the best films of the past 20 years--and thankfully its makers haven't tampered with it too much.